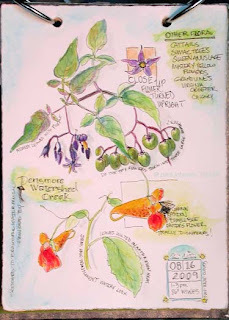 South Carolina LowCountry Nature Journaling and Art: Forgot to pack my Wildflower Guide! Forgot to pack my Wildflower Guide! I can remember the moment clearly. I was packing our suitcase and thinking I must not forget to throw my Roger Tory Peterson Wildflower guide in with my art supplies........ Really miss my scanner too. I had a lovely 2 hour nature break! The creek, which is usually dry this time of year, was gurgling away. How I love water music! Do you by chance know common and latin names of these plants? (you can get a slightly bigger, blurry image if you click on it) If so, please share. In the meantime, I'll try rephotographing and post a better image :) Many thanks! lovely sketching...I'll have a look again to see if I can find the latin names...and of course, the sound of water...wonderful! You have me laughing, Judy! Rob's doing quite well and will see the surgeon tomorrow for a progress report. Thanks for stopping by, Ronelle. I'm so enjoying your country home/sights! You know my first reaction to the one drawing was Jewelweed. I'm glad Quiltin' Mama could ID it definitively. I know two things about Jewelweed: 1, Hummingbirds seem to love it; and 2, and I might be a bit off here, it's been known traditionally as an antidote for poison ivy rashes. 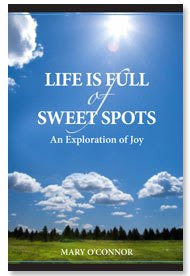 We see a lot of it here in Philadephia, especially along water. A beautiful plant.